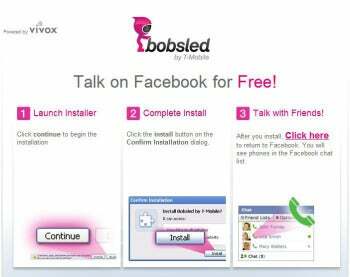 T-Mobile and app developer Vivox just launched a free, easy-to-use voice-chat application called Bobsled that allows people to call their friends from within the Facebook application or leave a voice message with one click. Bobsleds, you may remember from the last Winter Olympics, come screaming down their icy tracks at hellish and sometimes deadly speeds. The early reports suggest that Skype and other VoIP providers may indeed never know what hit them once word gets out to Facebook's half a billion users. Business Insider calls the voice chat app a "Skype killer" because it lets you call people on your Facebook friends list immediately, rather than requiring them to set up a Skype account first. The people you call don't need to have the app installed, although they do need a headset or mic and speakers. It works on both Macs and PCs. Vivox and T-Mobile claim that 88 percent of Facebook users they surveyed wanted voice chat. It may be a social lifesaver for people whose devotion to their virtual life is such that their friends don't remember what they sound like over the phone. T-Mobile exec Brad Duea told The Associated Press that the point of "Bobsled" is to put T-Mobile's brand--soon to be AT&T's brand--before more people. T-Mobile could also add advertising or start charging for calls from PCs to phones. The product has been test-marketed on Facebook under the brand name Vring, with T-Mobile's connection to the project undisclosed. The Bobsled plug-in, developed by Vivox, needs to be downloaded first from the Facebook Bobsled page. Restart your browser and you'll see a little green phone icon next to your friends' names if theyre available to chat. A pop-up box lets you check your mic and speaker levels, and you're off to the races, provided your friend answers the phone. If they don't pick up, you can leave voice mail by clicking the Bobsled icon at the bottom of your chat buddy list. According to T-Mobile's blog, the Bobsled brand will expand to include other cloud-based communications services: "In the near future, T-Mobile plans to evolve Bobsled by T-Mobile to include video chat [and] the ability to place VoIP calls to mobile and landline U.S. numbers, and [T-Mobile] will offer applications on smartphones and tablets across various mobile platforms, regardless of the carrier that powers such devices," the blog reads today.